It is not known if the street names were already in existence in 1811 when Jorge (George) J F Clarke platted Old Town and recorded them on his plat map. The original street names were in Spanish, but they have been anglicized and in one case misspelled. The following table shows the original and current street names; the comments in the Derivation column below range from the obvious to pure speculation! The street closest to the water. Either in honor of the Commandant, or because he may have resided on this street. Presumably it was a new street when Old Town was extended in 1816. Old maps spell it ‘Town Gate Street’. Entrance to Fernandina was once through the defended defile at the South end of Towngate. ‘Paseo de las Damas’ would translate to ‘Ladies’ Walk’ or ‘Ladies’ Promenade’ or ‘Ladies’ Avenue’ suggesting a pleasant place to 'see and be seen'. The inference that this was the red-light district has some plausibility given the nature of the town, but such activities were normally somewhat removed from residential areas. Also it seems unlikely that the planners would name a street for this activity. The OTG map uses no title for 'Fernando' suggesting that it is named for the King. The Tilson map contains an illegible designation for Fernando, probably either 'Sn' (San or Saint) or Sr (Senor, a term of respect for the King). It would seem unusual to have both the town and a street named for the same person, so having the town named for the King, and the street for the Saint may be plausible. But if it is the Saint, why did the cartographer bother to compress 'San' to 'Sn'? Named for the Marquis de Someruelos, Captain-General of the Spanish Provinces of Cuba, Florida, and Louisiana. Born 1754; died in Madrid, Spain in 1813. 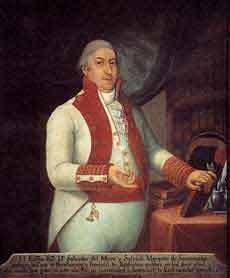 The Governors of East Florida (like White and Estrada) reported to him, and he reported to the Spanish Royal Court. Street signs are currently misspelled. Pronounced SOM-ER-WAY-LOS. This portrait was painted by Juan del Rio (1748-18??) and is part of the collection of the Museo Nacional de Bellas Artes de La Habana (Havana, Cuba), whose permission to reproduce this image has been sought. 'Jardines' is the plural of 'Jardin' = Garden. So correctly this should be anglicized to 'Gardens Street'. Or perhaps it was named for the Jardine family; we know that Isabella Jardine lived here in 1817, although not on Garden Street. The two maps below are printed in the Old Town Guidelines on pp.5 and 11, but they are rather hard to read. Thanks to Professor Tilson, we have a clearer version of the 1811 map (reproduced below). There are a number of subtle differences between the two 1811 maps, and they suggest that the copy in the Guidelines may be the ‘as-submitted’, while the copy below is the ‘as-approved’ version. The 1821 map shows the extension of Old Town eastwards beyond Commandant Street in 1816. The ‘new’ streets that were added in this extension were ‘New’ and ‘Towngate’. Alternative map provided by Prof. W. Tilson. Note Estrada’s signature in the Approval box, and the notes at the top left of the map. Map showing lots in Old Town based on Spanish records. Drawn by Franz Dollheimer in April 1937. 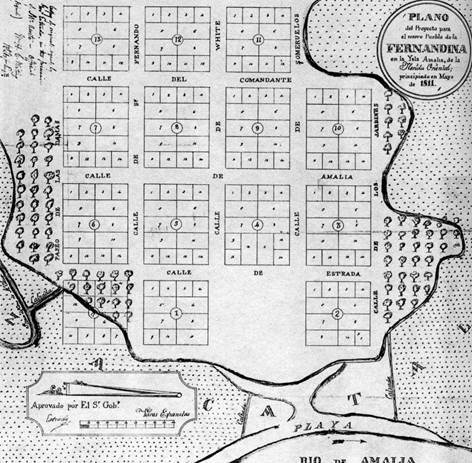 This copy appears in Old Town Guidelines p.11, titled Map of Old Town, Fernandina, Florida, 1821.